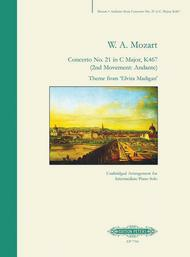 Concerto No.21 in C Major K467 (2nd Movement: Andante) (Unabridged Arrangement for Intermediate Piano Solo). Composed by Wolfgang Amadeus Mozart (1756-1791). Arranged by Ian Flint. For piano. Sheet Music. Published by Edition Peters (PE.P07704).Famous as the theme from the 1967 Swedish film "Elvira Madigan" - arrangement for solo piano; neither abridged nor simplified.